On May 21, 2015, HasNa screened Hüseyin Karabey’s 2014 Turkish film, “Come to My Voice,” at the Avalon Theater in Washington, DC. It is a simple enough premise, but powerful in its ability to bring to light the realities of a typical Kurdish village’s unfortunate interactions with police through a storyline that seems at once natural and mythical. The stories within stories, local music, and tranquil mountainous landscapes are woven into the sad realities facing the villagers. Many elements struck me and will continue to linger in my mind, from the grandmother who, through her actions, teaches her granddaughter strength, courage, discretion, and kindness, to the respect and compassion with which the men and women of the village treat each other. In sharp contrast is the way in which the protagonists are barely treated as citizens within their own homeland, subjected to checkpoints and humiliation. 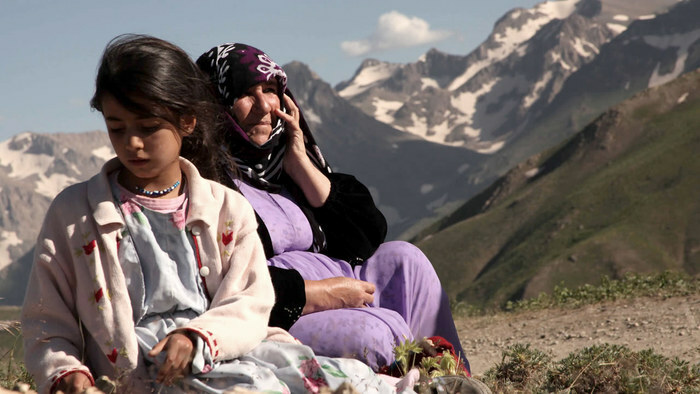 Beyond the typical suspicion and threatening aggression in such scenarios, the reality of cultural oppression is also manifested when the officers make condescending remarks about the villagers’ Kurdish dialect, insisting that they speak in Turkish. Karabey – both the director and writer – subtly adds complexity to characters in an absurd situation. The villagers in poverty, accused of harboring weapons, are forced to find guns they had never before sought in order to free some of their men from jail. As in any case of human interaction during any given conflict, across all time and space, there will always be a variety of individual behaviors. Of the dominant group asserting its power, some will play along and simply follow orders, others will abuse the system and use it for personal gain, and still others will follow their conscience and show compassion toward the oppressed. Because we see examples of all three behaviors, the film manages to show the humanity in soldiers who find themselves pressured to participate in oppression through a depiction of the system as the root problem, not any one group. Through personalizing and storytelling, films and media have the power to both raise awareness and change perspectives. The Harmony Institute, a research center that studies the impact of media on individuals and society, acknowledges that impact could take many forms and is often difficult to measure. Nevertheless, the Institute’s studies have shown that character attachment creates a strong emotional experience, and that can make a story an effective means to contributing to social change. Jonathan Gottschall, Ph.D., explores a unique theoretical perspective of the purpose and impact of storytelling: being able to relate to fictional characters can influence a given attitude more than typical factors such as one’s background and beliefs1,2. This is due to forming judgments about the characters in the same way as we would real people, which then ends up impacting generalizations on those groups or issues. Hence, in the case of Karabey’s film, anyone can relate to the bond between the grandmother and granddaughter and their determination to bring back their missing family member. Gottschall argues that the proliferation of American TV shows and films with likeable characters seems to be a large factor in drastic shifts in American public opinion regarding various groups. Gottschall even believes that fictional characters may effect social change as strongly as direct political action, and certainly more so than nonfiction, when people keep their critical guards up against something clearly meant to persuade them. As for the film, one turn of events, in particular, really moved me. When the granddaughter decides to take matters into her own hands in order to save another man in the family from danger, a powerful message of love and sacrifice arises. The message is all the more potent and tangible through the tacit understanding between the granddaughter and grandmother that they must take this risk. I can imagine that, whether one has heard nothing of Kurdish people, or only negative depictions, this part of the film would be moving and memorable. In this ever more interconnected, globalized world, the power of storytelling can help us make sense of news, empathize with people from other cultures, and put a human face on issues to which we would otherwise have trouble relating. It can also make us re-evaluate issues that are familiar to us. Along the same lines, HasNa, through coordinating projects between conflicting communities in Turkey, Cyprus, and Armenia, puts a human face on neglected and misunderstood regions. HasNa’s focus on relatable human needs and desires – from agriculture and business to youth and female empowerment – is what leads to inspired members, progress, and peacebuilding. The impact of individual stories through collaboration is as noteworthy as the impact of the film’s stories, as evidenced by its People’s Choice Award at the Istanbul International Film Festival. There is hope that people everywhere are open to re-shaping their long-held views of socially and economically excluded populations. HasNa is open to future screenings of this film. Please contact us if you would like to get involved in organizing an event. Gottschall, J. (2012) The Storytelling Animal: How Stories Make Us Human. Boston, MA: Houghton Mifflin Harcourt. This blog post was contributed by Michelle “Zephyr” Williams, who is currently an intern at HasNa Inc.
Next StoryInterested in a scholarship for a Master’s degree in Business Administration at BAU International University in Washington, DC?